Do you need the benefits of Sage 200 but feel like the cost of the hardware to run it is unjustified? Or perhaps you are thinking about going down the cloud route but you are unsure whether it is the right accounting solution for you. Sage has provided a new cloud accounting solution with Sage 200 Extra Online. It allows those with a requirement for Sage 200 but no budget for the hardware requirements of on-premise to upgrade and meet their needs, or for those who need to be able to access their accounting system from anywhere. As cloud computing is becoming more common in the areas on technology it makes sense for Sage to follow suit and provide a solution to the ever growing problem of accessing your data anywhere. Do you have users spread out nationally or internationally? Or maybe you want to monitor your business from your sunny villa in Spain? Sage 200 Extra Online is a desktop app that runs completely on your internet connection. As long as you meet the internet speed requirements, wherever you are you can get access. With Sage 200 Extra Online the system is installed on your PC/Laptop and then connects to your data through the internet. If you have your laptop with you and are connected to the internet you will be able to access your Sage data. If you don’t have your laptop with you then you can still access some data through the Web workspaces and summary screens that are available with Sage 200 Extra Online. All you need is access to the internet and a web user license linked to your username. You can then get access to the workspaces and summaries on any Laptop, PC or Tablet. 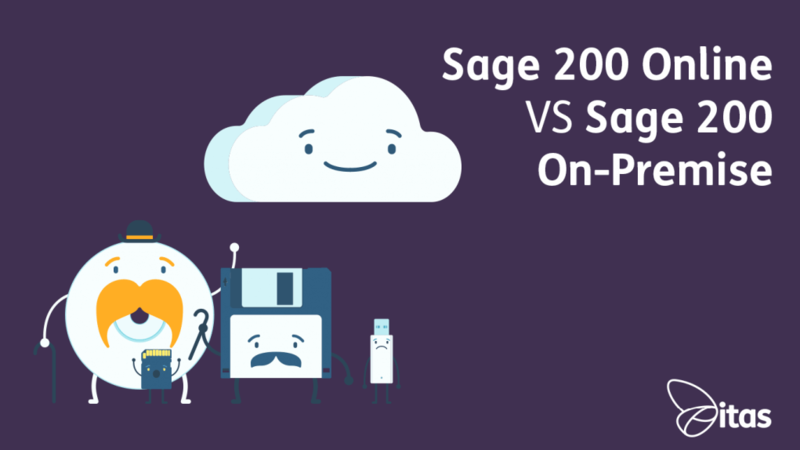 With Sage 200 Extra Online you get enhanced security with automated back-ups. Your data is stored on the Windows® Azure™ platform with data centers that comply with key industry standards for enhanced security. Along with this, Sage provide automated backups and 24/7 monitoring. As the world is becoming ever more cloud-based, it’s no lie that there is an ever-growing number of cybercriminals looking for sensitive data. By using Sage 200 Extra Online your data is stored and protected on a best-in-class platform. By storing data off-site and in the Microsoft Azure Platform you don’t have to worry about data loss due to regular backups and 24/7 monitoring. On-premise Sage 200 requires the data to be stored within your domain and you are responsible for providing any security or protection for your data. With online your data is stored off-site so is not at risk from data loss due to a potential fire or other disasters. Also, you can download these backups as you please and store them in a secondary location to add further protection. Sage 200 Extra Online requires a laptop/pc with an internet connection that meets their minimum requirements. The requirements are easily achievable with current internet available throughout the UK. The only other thing Sage ask for is a PC/Laptop that has at least 2gb RAM, with a broadband connection. All newer PC/Laptop models will at least meet this minimum requirement so it is easily available and not very costly. If you want to access the workspaces and summaries then you have to meet the minimum requirements set by Sage. This covers most devices including Android Tablets, Windows Tablets, and iPads. With Sage 200 Extra Online it is easy to upgrade to the latest software releases. This means that you can keep up with the latest releases with no cost and little disruption. The software version is managed through the Online Portal and can be upgraded with the click of a button. When you open the program it will automatically update and all is then needed is a short upgrade of the company data. The Sage 200 Extra Online portal is accessible by all site users and administrators. That gives you the ability to download backups of your data and request backups to be taken. This gives you the freedom to pull down the latest backups and store them on a local drive for extra piece of mind. Base user management is all controlled from the online portal. Here you can add new users to your site and give the user or administrator permissions. This will allow the users to log in to the portal and download the Sage 200 app to access the program. Account management within the Online Portal is easy and simple to use. Through the portal, you can quickly add more users to your license or add other modules and increase your compute. This allows you full control over your monthly costs and allows you to easily increase your allowance as your company grows. The great thing about Sage 200 is that it is available in a variety of deployment methods, whether you’re looking to have your accounting software on-premise, hosted or on the cloud, there is an option for all businesses. Get in touch or request a demo to see Sage 200 in action today.